Alma Claude Burlton Cull (1880-1931). Watercolour signed and dated 1923. Image size 10 x 17 ins (25.4 x 43 cms) approx. REPULSE (Captain F C Dreyer CB CBE) in company with HMS HOOD (Captain G Mackworth DSO CMG) sailed from Devonport, England, on 14 September 1922 to attend the centenary celebrations of the declaration of Brazilian independence. Having called at Gibraltar and St Vincent both ships arrived off the coast of Rio on 3 September and anchored for a few hours off Ilha Grande, some 30 miles west along the coast from Rio de Janeiro. Here they were able to check out their appearance and to smarten up the paintwork and generally “tiddly up” before they shifted to the high visibilty anchorage off the city to where an international collection of warships from the host, Brazil, and Argentina, Mexico, the USA and Japan had gathered for the celebrations. 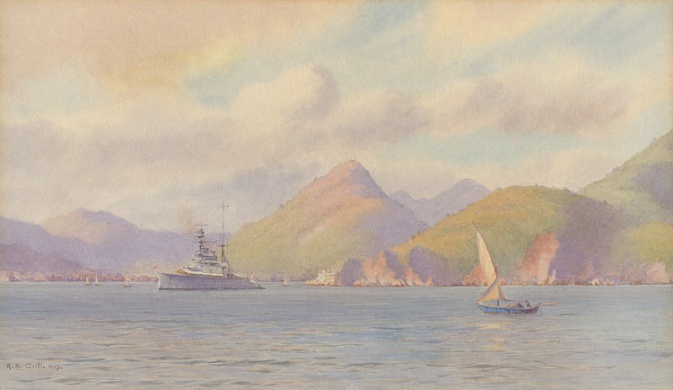 This watercolour possibly shows REPULSE as she lay at anchor off Ilha Grande whilst she and HOOD preened themselves before heading off for the international warship anchorage off the city of Rio. Cull has shown some Jangadas, the traditional sailing craft of the area, checking out the new arrivals as they busy themselves at anchor. Celebrations over and many of the “Goodwill Olympics” trophies collared by the two British battle cruisers, they sailed on 14 September for Santos (Sao Paulo) arriving back in their home ports in time to give Christmas leave. A delicate watercolour, typical of Cull’s palate and style at the time, this painting was very recently (June 2012) unearthed in New Zealand. Did it find its way ashore there from the battle cruiser in 1924 when REPULSE, again in company with HOOD, paid a visit there during the famous Empire Cruise of 1923-24?